I am researching the setting and background for a new novel, which I hope to set near Seattle, WA. I’m going there next month for a week and am trying to sort out what I need to know by the end of the week. Sensory Details. I’ve written about the importance of vivid sensory details here, and here, and again, here. As a young writer, I heard over and over, “Show, Don’t Tell.” When I finally made that more specific–use vivid sensory details–my writing took off. I can’t over-emphasize the importance of great sensory details. I consider it the basic writing exercise for fiction. That means, I need to walk around the proposed setting and be a fully-present human. I need to soak in the smells, tastes, sounds, sights and what it feels like to move around in this place. I remember a couple years ago, I was at a conference on Puget Sound and a salmon was swimming up a tiny stream. Thrashing, 3-foot long salmon, powerful tale, the smell of salt water and the bacon I was eating at a restaurant, the stream only 2 inches deep, the salmon like a Gulliver in Lilliputia. When I write details, I don’t care about whole sentences. I’m just creating a word bank so that later, I can draw from the memory what I need. I also need to be able to extrapolate. If it’s like this on Bainbridge Island, would it also be like this in the San Juan Islands far north of there? I need specific enough, yet general enough details so that the story comes alive, but isn’t bogged down by details so specific that I can’t move around the area. Port Townsend, WA. 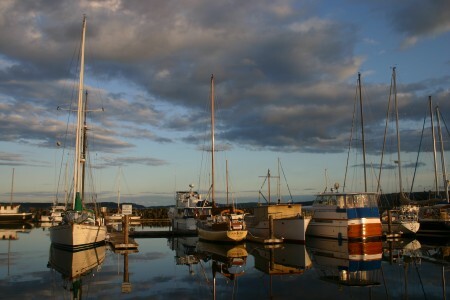 My husband took this photo when we were in the Seattle area a couple years ago for a sailing trip. Photographs are great research tools. Click to enlarge and see just how spectacular this photo really is. Copyright 2008, Dwight Pattison. Facts. Oh, dear. There are so many facts that I need to know about the Seattle area. Volcanoes, Puget Sound, school system, boats and on and on. I can absorb lots of that just by visiting the area, but fortunately, I do have long-time residents who can vet the story for me after the first draft. I need to know enough to get the STORY right, and then details can be tweaked. Logistics. Of course, this is another category of facts, but slightly different than what I meant earlier. For this, I need to know transportation details. How long does it take to go–walk, bike, drive a car, swim, take a ferry–from point A to point B. This is crucial to developing a reasonable time line. Part of this is understanding maps, of course, but mostly it’s about physically moving a person around the landscape. Culture. Now, here’s a fuzzy one. What cultural elements will impact the story I am planning. Attitudes, beliefs, institutions, dialect/slang unique to the area, how people here DO something–so many subtle and not-so-subtle things need to be taken in (and again, vetted by long-time residents after the first draft). Whether you create your setting from historical details, contemporary details or create a a fantasy world, this is a crucial step in creating a believable story. Don’t forget the coffeehouse attitude in Seattle,Starbuck’s birthplace. Home of the grunge look. If you are writing a children’s book, you may want to check out The Old Spaghetti Factory. It originated in Washington too. Be prepare for wet days and overcasts. Expect to see constant slippery, wet sidewalks. Seattle seem fresh and always clean to me due to constant rain. Thanks, Sandie for the reminders. My BIL lives on Bainbridge Island, so we’ve visited a couple times, but I’m far from comfortable writing about Seattle. For sure, weather and coffee! I’d try the Old Spaghetti Factory except–I need a gluten free diet. Sigh. Fresh and clean–a great description. This is a really great post! I’m revising a novel now and I plan on setting part of it where I grew up, but since I don’t live there anymore, a visit is clearly in order! Also, I love your advice about sensory details, very helpful. Glad it’s helpful. I really think that sensory details are crucial to a story. Thanks for this great post. It’s given me some good prompts and ideas for taking notes for a future project. I’m visiting New York in October (a long way from Australia), and really want to get the sense of autumn in that city. Sounds, smells, colours, street names, coffee culture, clothing, traffic, tourists versus locals, travel time, historic sites, etcetera. Ah, what a trip! October in NY will be great fun! I’m hoping to visit Australia some day–and that will be a sensory detail feast for me! I love good characterization, but settings can often make or break a book for me. I love books that take me to a place and make me feel like I’m there. I recently read a novel set in Cincinnati (my hometown). I kept flipping to the back blurb about the author to figure out what her tie to Cincinnati was. She had most of her facts right, and I could visualize the streets and places she mentioned. But there were a few details about the culture that were completely wrong. It threw me off. All in all, it didn’t detract from the story. No one outside of Cincinnati would even notice what I’m talking about. But it left me wondering how much she really knew aout CIncinnati and whether she’d ever lived here. I’d guess not. While you are in Seattle, you might want to check out some of the numerous districts which are their own little communities and subcultures–places like Fremont, Wallingford, the U-District, Alki, Georgetown, Capitol Hill, Magnolia, and certainly the Scandinavian-influenced Ballard. (Lutefisk, anyone?) Also, don’t know when in May you will be here, but if it is over Memorial Day weekend, the massive Folklife Music Festival will be in full swing. Hope you have a wonderful visit! Thanks, Lisa, for the suggestions! I do plan to look around a lot. Sadly, no, we’ll miss the Folklife Music Festival. Great insight into the setting–small things can make or break it. That’s why I’m reluctant to write about an unfamiliar setting. This time, though, I think I’ll have lots of readers to help me get it right. If I ever write about Cincinatti, I’ll call ya!